Lorraine Gorham is one busy clubwoman. Not only is she a wife, mother, and grandmother, she is also a member of seven clubs and serves as a club president and state chairman. 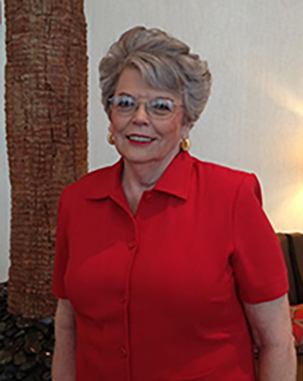 She has a passion for helping veterans, a knack for fundraising, and is always looking for a new opportunity to serve GFWC and her community as a whole. What kind of leadership roles have you held within GFWC or other community organizations? I became a club president about 40 years ago and since that time I’ve held every position you could think of. It seems like I’ve never been without a state level position. I’m currently the Veterans Chairman for Massachusetts as well as the club president to multiple local clubs, one being the GFWC Ms. Senior America Club that I started four years ago. I am also the incoming Treasurer for the New England Region. I was a member of Quota, a similar organization to GFWC for executive business women. I was their area director and traveled with them throughout the United States and internationally. What is the benefit of being in multiple clubs? I believe in the General Federation of Women’s Clubs and what they do for everybody. It’s a way of supporting the arts, education, veterans, and more. I want to see that continue. The way I can get that to continue is by making these clubs stronger and taking up challenges or filling a need within each club. What project or initiative has been most important to you as a clubwoman? The veterans are very close to my heart. While I was State President I raised over $25,000 for the veterans of Massachusetts. That was my special project. We make sure we take care of them. Clubs in my area and across the state go visit the veterans in the hospital because that is what is needed the most. If you go in there and shake their hand and have cookies and coffee with them, it makes them feel appreciated. I’m now known as the “Federation Lady” at the Holyoke Soldiers Home because I always visit and spend time there and bring T-shirts, socks, and toiletries. I believe in the General Federation of Women’s Clubs and what they do for everybody. It’s a way of supporting the arts, education, veterans, and more. You are known for you fundraising projects and fashion shows. What have been some of your most successful fundraising events? When I became State President, Massachusetts was in desperate need of funding. I was a bridal show store owner for 30 years and ran many bridal shows so I decided to run a fashion show for the state which raised about $12,000. Since then I’ve run two other fashion shows as major fundraisers and will be running another fashion show for [GFWC First Vice President] Sheila Shea to pave the way for her installation. This show will be for the entire New England Region and we will have vendors, exhibitors, and raffles in addition to the show. We have a very large goal for Sheila’s show—$25,000—so I’ll need the help of everyone. You have also helped plan pageants in Massachusetts. How did you get involved with these events? I was First Runner Up, Senior Ms. Massachusetts in 2000. The pageant recently lost some funding so I decided to help. We started a new club specifically to raise funds for the event and run the pageant show. We typically raise $6,000-8,000 each year to keep it going. Any woman in Massachusetts over the age of 60 can compete. Winners go on to compete in Senior Ms. America. What do you consider your greatest accomplishment with GFWC? Perhaps just spreading the word about GFWC and what it stands for and how much volunteerism we do in our state, nationally, and globally. It’s astronomical when you add it all together. We don’t have a lot of people, but the people who are part of our group just give and give. Like everyone says, we’re the best kept secret. If only we could get the word out to everybody.